Figure 1. 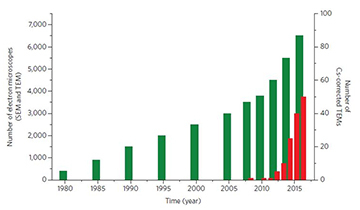 Number of electron microscopes in China. Data is up to 2016. With the increase in China’s economy, the Chinese market is becoming a crucial one with the largest potential for EM companies. Each single segment market deserves full attention and investment. The development of advanced materials and advanced industrial manufacturing relies on smart design and precise engineering. Microstructural control is key, and comprehensive facilities and expertise in electron microscopy are needed for this. NSFC has provided financial support for hundreds of projects in universities and research institutes in recent years. ² It needs to be pointed out that the term “industry market” does not necessarily imply low-end market and “academic market” does not mean high-end market either. For example, the electronic/ semiconductor industry will be a good segment market which we should focus on in the future. The Chinese Government has invested a huge amount of resources in it  – and this is a high-end one. They are asking vendors to offer the best high-level EDS to detect nanostructure of less than 10 nm. For most customers, we need to develop a complete workflow and application solution in the niche market rather than just the most advanced products, and this helps us to grow together. EBSD in China is currently becoming a hot topic and key segment product, especially since 2016. It is promising that EBSD applications in China have increased greatly and continue to grow. Most researchers are trying to add EBSD on their SEMs. As a sales manager, I have plenty of opportunity to visit customers who are from various different backgrounds. Although their application needs are customized, the demand for EBSD is still growing. High-end EBSD customers need an EBSD detector with high speed and high sensitivity. EDAX is able to offer different EBSD solutions tailored to a variety of applications and requirements. We are taking a long-term vision and expecting a tremendous change in the next ten years. We need to think bigger and more! At EDAX we will be improving our product offerings in the coming years by developing specific application solutions and products for better cooperation with leading customers in each market segment. Secondly, we will also promote the capability of the service and application teams by developing a comprehensive training system and strengthening our human resources in China. Lastly, we are enhancing team collaboration and improving efficiency by clarifying the responsibilities of positions and optimizing internal communication. For the Chinese market, EDAX provides specific EDS and EBSD products to both entry-level and high-end customers in each niche market. We believe that in the coming months and years we will be able to provide more solutions for customers’ fundamental research and technology development. We are hoping that we will have a bright future with the Chinese market.